EVK-HADES1210 Evaluation Kit implements a power half-bridge based on the HADES v2 isolated gate driver and two CISSOID's NEPTUNE, a 10A/1200V SiC MOSFET. It includes an evaluation board that can be used immediately to implement a power converter or a motor drive, and is designed for bus voltage up to 1200V and with application current up to 10A. The two channels can be controlled independently of each other or use a locally generated non-overlap delay. The Reference Design is based on the 2nd generation HADES chipset which consists of 2 devices: a Primary device CHT-HADES2P and a secondary device CHT-HADES2S. The solution includes an isolated power supply built around CHT-HADES2P PWM controller. 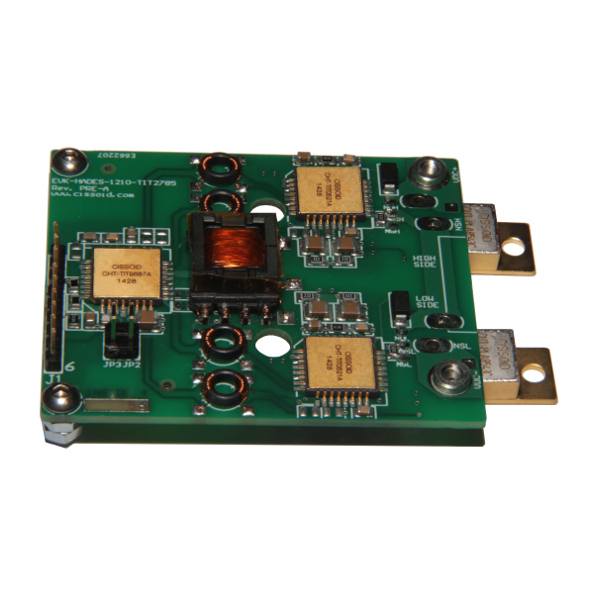 The Evaluation Board EVK-HADES2® can be used for immediate testing with SiC MOSFET devices. The board is populated with CISSOID integrated circuits in ceramic package guaranteed for -55°C to +225°C. The board is based on a polyimide PCB (rated 200°C). The passive components and the desaturation diode allow operation up to 175°C, with possible short excursions to 225°C for testing. The evaluation board is delivered with the complete electrical schematic, the bill of materials including active and passive components, the Gerber files. Delay time (PWM to VOUT): 200ns typ. Power FET gate rise time: 40ns typ. Power FET gate fall time: 40ns typ. DC-DC Converter switching frequency: 180kHz Typ. A product brief for EVK-HADES1210 is available for download (see above). The application note is available on request: Request EVK-HADES1210 application note.